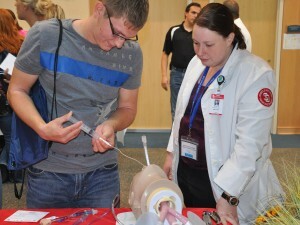 USD Sanford School of Medicine student visits with a high school student during Scrubs Camp 2012 in Yankton. Yankton Rural AHEC offers programs to educate and inspire young people to choose a career in healthcare. These programs, such as camps, career fairs, mentoring programs, guest speakers, offer a fun and exciting environment with real-world examples and experiences. Opportunities are designed for students to discover the possibilities available in the healthcare professions, identify college prerequisites and requirements, and equip you with the tools, information and resources needed to pursue an rewarding healthcare career. Based on population and employment statistics, projections indicate that thousands of workers will be needed in the healthcare industry in the next decade. 20 physician assistants, 13 family and general practitioners, 11 surgeons, 45 pharmacists, 65 pharmacy technicians, 29 EMTs and paramedics, 93 licensed practical nurses, 31 medical assistants/registration and 23 medical laboratory scientists …. and more. In the next 20 years, the pool of potential workers shrinks statewide and the number of elderly in need of services doubles. Educators who work with youth, whether in or outside the classroom, play a critical role in instructing our youth about healthcare careers. Yankton Rural AHEC provides instructional tools, activities, and information educators can utilize to educate students and their parents about the many careers in healthcare. Some of the resource YRAHEC provides are lessons, “In-A-Box” curriculums, classroom visits, professional development/in-services, displays, and participation in career fairs.